Sunbreak Press/Blue & Ude Writers Services, 9781732128705, 72pp. 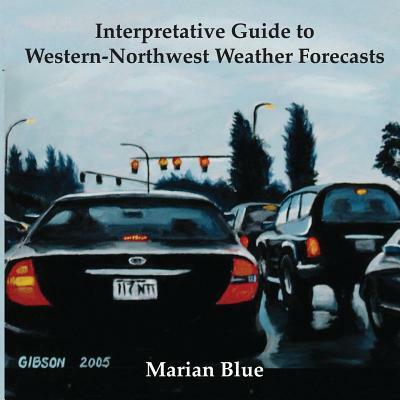 The Interpretative Guide of Western-Northwest Weather Forecasts shines some humorous light on the challenges and creativity of weather forecasts within the unique Great Northwest, influenced by the Pacific Ocean, Olympic and Cascade Mountains, Puget Sound waterways, and many islands. Micro-climates include rain forests, rain shadows, convergence zones, cityscapes, and altitudes that range from sea level to 14,411' (Mount Rainier)-all of which are wet to varying degrees. Throw in the possibility/probability of sunlight and a forecaster's possible desire to be both accurate and well-liked, and the result is a vast array of conditional terms and statements that range from confusing to creative. Is the day partly sunny or partly cloudy? Are the showers scattered or isolated? What is a sunbreak? How does a water year differ from a calendar year? Why is it drier in a rain shadow? Why are these and other terms used? Author Marian Blue ironically considers the many ways forecasters can predict rain without saying that word. Terms are listed and defined. Color photographs, paintings, and graphics provide clarity and beauty to explanations. Also discussed is a bit of history, from the days when in-comers to the region were discouraged to the more welcoming culture of today. Dean Gibson, who did the cover as well as other work in the book, pursues his art (oil on canvas) in the forest in Western Washington. The rainy climate inspires many of his paintings. His regional scenes with streetlights and reflected water are collected and displayed on both coasts. Dean's work ranges from figurative to abstract-often featuring bright, bold colors like those he encountered when he lived in India. Lynne Hann, as a nature photographer, makes images of objects living in the outside world as well as those whose song has ended. Designs and patterns co-mingle in her favorite photographs while abstract lines, color and dancing light gain her most constant attention. The Northwest is her favorite study hall. The variety of natural elements, geography, and conditions found scattered there hold her in a state ofsustained passion. Lynne has had several public exhibits of her work and many of her images have appeared in magazines, books, calendars, and publications. For more, visit her Website at www.hannphoto.com. Cherie Ude currently resides in Florida, pursuing natural images in the wetlands and on the shorelines. She also photographs special events, such as weddings, baby showers, family reunions, and other occasions. She has pursued photography throughout the U.S. and many parts of the world, including Europe, Canada, South America, Australia, and Antartica where she worked for five years. She also lived on Whidbey Island for several years, capturing the many moods of the Western Northwest. See her images appear on Facebook at Cherie Ude Photography. A must for the potential in-comer, the more recent arrivals, and the still weather-befuddled locals of the Great Western Northwest. A lovely gift book. Also an excellent companion book to How Many Words for Rain, a book of poetry by the author with photographs by Lynne Hann.